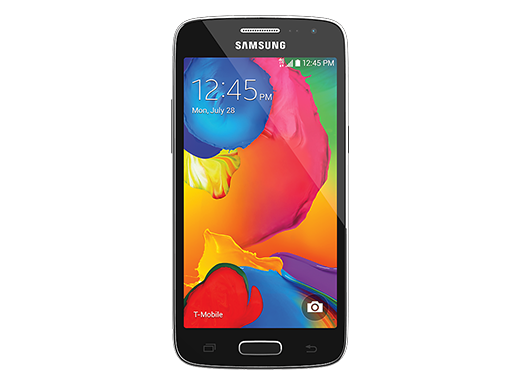 After weeks of speculation, T-Mobile has finally launched the mid-range Samsung Galaxy Avant. The device landed on retail store shelves today, and is available to buy online for just $216 full retail price. On EIP, that’s $0 down and 24 monthly payments of $9). The Samsung Galaxy Avant boasts a stylish, slim design housing a powerful Quad-Core 1.2 GHz processor, 1.5GB RAM, and a brilliant 4.5” qHD screen that puts your world on display through ultra-high pixel density. Unique Samsung features further simplify the user experience, including Easy Mode to make the phone easier to navigate for first-time smartphone users, S Voice™ for convenient assistance in your daily life, and Samsung Smart Switch™ to make it even easier to transfer your content to your new device. Let us know if you plan on picking up a Galaxy Avant, and more importantly, let us know if you spot this mystery Device Unlock app and if you can get it working. if you can port that out and install it on other samsung phones to unlock it would be amazing. Drop the price a bit below $200 and I’d consider this phone as a backup. However, I’d rather invest in a better model with better specs and features. I don’t feel that this phone is on par for a “midrange phone.” I’d rather get a Windows Phone for my parents then give them this device. This is just my opinion. The spec list cam just posted says 16 gig internal. Is that incorrect? Yes, the sources I was looking at had it at 8 Gig. I was wrong on that one. There’s not a lot of site pages that have the specs as of today. This phone is pretty comparable to a Moto G with LTE aside from screen resolution. Performance may or may not be on par due to TouchWiz, but with lower screen resolution it would likely put it closer. I’ve founds sources that have 1Gig and 1.5Gig of RAM, but I don’t consider them reliable. I can’t seem to find a Samsung page for it. The t-mobile page says 1.5 GB could be wrong though they don’t always put accurate info. I went and couldn’t find the RAM, but I’m also on a crappy “secured” version of Explorer so I could have easily missed it. They’re also known for not noting that kind of information on the pages. I appreciate you correcting me in the matter and not being rude about it. Something about band 12 or VoLTE? sounds much better than the Alcatel one touch fierce my son uses. This might make a nice birthday present for him. If I were in a market for a replacement for my old S2, would this phone (with LTE support, new OS, mostly better specs with 700Mhz coverage in CA) be a better Ioption then going with used or refurb S3? I am not a power user and just use phone for ocassional browsing and its camera capabilities. Not looking to spend more then $250 (prefer to stay in $200 range). Also, pretty much has to be an Android OS. Thanks for any feedback. Wal-Mart is selling the Galaxy Light for $49.88 this week. Good luck finding it, though. There has been a thread on SlickDeals about it since Saturday. I picked mine up on Monday. It is a fantastic phone (for my 7-year-old to use as a game/media device). Wow. Ya that is a great device at that price! & it’s easily unlockable too. I had tried a light in the past as well & the camera on it was better then some more costly Samsung’s too. Yeah, if youre only doing occasional browsing then I agree with Nurdface, you should go for the Samsung Galaxy Light before its sold out. At the moment its only $100. They also have the LG Optimus L90 which came out a few months ago which has a lot of similar specs to the Galaxy Light and also is $100 dollars at the moment. The LG phone is also bigger. I just bought my hubby a Moto G to replace his Sam Galxy Blaze. One of the biggest drawbacks of the Blaze is the crap loaded on by T-Mobile and the overhead of TouchWiz is a big drag on a phone with otherwise respectable specs (for the time). Maybe being able to “unlock” and discard this riff raff might help. If not this phone too will be seriously compromised. So I wanted to try something different even though I was aware this was on the verge of launch. The device unlock app is just so it can be unlocked remotely instead of having to track down a non t-mobile SIM and enter an unlock code, akin to what the iPhone can do. Its NOT going to let you unlock your EIP locked phone. Surprisingly, you still have to pay for what you buy. makes a great way to prove your phone is out of EIP for reselling purposes! Don’t buy a nonunlocked tmobile phone. Its product page lists band 2 (PCS/1900) and band 4 (AWS/1700/2100) LTE, leaving band 12 (700A) out. Its tech specs support document lists those two in addition to band 12. Yep, it has LTE 700 so it’s future proof for now. Pretty good price, truly unexpected from Samsung. Be interesting to see how this compares to the MotoG LTE, which I’m using, having some similar specs and same pricing. The lack of wi-fi calling on the Moto G (or X) is a major deal-breaker. I’ll wait for the Avant to drop in price (or pick up a refurb) to replace my daughter’s LG Optimus L9. Oh yeah. I have had Moto G LTE. I am sure it’s much better. I am not a fan of touchwiz myself either. I’ll take Moto G or X which I am using now with Cricket any day. The 299 price running on the X is worth the bit extra money. I even got a surprising 150.00 off the X from amazon due to the seller saying unlocked. Assuming factory, But it had AT&T logo (which still works for me). The camera still needs some work. But luckily apps solve it’s exposure problems. Until I get the latest update & then we shall still see. Anyhow point is though I am surprised that Tmobile is the only carrier that does not sell the X with any discounts through their channels direct. The G also of course is better then all these other mid rangers they keep releasing from Samsung, Lg & those Alcatels are the worst. So you only paid $150 for the Moto X? 153.98 to be exact :). I was just asking Amazon to send me another one, Or I was thinking I was going to send it back. But then the chat agent said what if I refund you & you keep it. I was like oh wow you mean the full amount. He said no partial &offered 125. I got 150.00 off. Nice! I won’t even attempt to duplicate lol. Haha. You could try Amazon is pretty awesome. Top notch all the way around! Knock on wood. Once the phone is unlocked from T-Mobile to use on whatever other carrier you might be imagining, it’s unlocked for use on any GSM carrier. By putting another carrier’s SIM card in the phone, it does not relock it. No band 12 support…just checked the box listing the bands, it’s band 1,2,4,5 for LTE only. Ok ive found specs for this phone. Those specs arent bad for a budget phone..